Home / Asia / International / Travel and Living / Hong Kong Visa on Arrival Immigration advise for Indians! Hong Kong Visa on Arrival Immigration advise for Indians! Hong Kong is a small country (technically known as Special Administrative Region) close to China (it got freedom in 1997, more history here). In many ways, Hong Kong seems similar to Singapore (separate post planned on that)- it has lots of high rises, dense population, modern public transportation system and attracts good number of tourists and business visitors alike. However, our experience at port of entry was not that simple. We had to undergo a 30 minute process during which our bookings, flight tickets, itinerary etc were thoroughly investigated, before being allowed in. 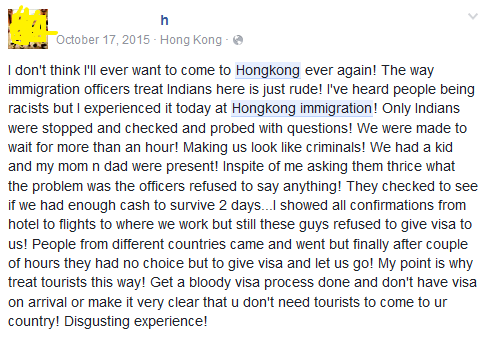 Almost all Indian passport holders have reported undergoing similar rigorous investigation at Hong Kong. One sample below, from a facebook friend. Profile image and name masked to protect identity. Travel Blogger Sankara has narrated his experience here. He was subjected to additional probe because he booked a stay in a residential area using AirBnB. Of course every country has all the rights to decide whom to let in and whom NOT to. That is the sovereign right of every nation. Being allowed into a foreign country is a privilege not a right. Before we debate on that, I will share my experience in brief. From Chennai we directly landed in Macau (via Bangkok) and immigration in Macau was super smooth. No questions asked and we were let in. After spending 2 nights in Macau, took a speedboat to Hong Kong. At the ferry terminal, we lined up for immigration but as our turn came, we were escorted to a waiting area. Many other Indian families were also waiting there. A young officer took our passports, went inside a room. My guess is he checked it against a list of people banned from entering Hong Kong. He came out and called me to the interview room. I showed him my cruise and hostel bookings, return tickets, Macau hotel bookings etc. After thorough inspection, he asked me to show if I have enough cash, asked me about my job back in India etc. Answered all of them patiently. A hostel booking receipt said 2 rooms. I was asked why I booked 2 rooms- I had to explain that it is a hostel and we had booked 2 beds, just that receipt shows it as 2 rooms. He asked me to show photo of my hotel room in Macau, which I happily complied. Finally we were allowed in, but the process took 30 minute and made us feel if we had done some mistake. The young officer was firm and demanding, but was receptive to my responses and was reasonably considerate as much possible under the circumstances. All other Indian families who were held up also left after a while. Possibility 1: Bad experience with Indians- May be our fellow Indians have misused this facility in the past- like overstaying the visa or doing work under tourist visa or causing other nuisances, which has forced the HK authorities to take tough stand against all Indians. Possibility 2: Monthly quota? May be immigration authorities have some monthly target to meet- of people rejected entry and they think Indians are most likely to have some faults based on which they can be denied entry. Possibility 3: China influence? May be China wants HK to be extra careful on Indians as India and China do not share a mutually supportive defense relationship. I don't know which one is true or if there is some other reason. My guess is it is mostly #1. 1. If you have an option, DO NOT visit Hong Kong- Singapore is closer, cheaper and relatively better and has all tourist attractions Hong Kong can offer. (Separate post coming up). If you don't have any particular reason to select HK and any vacation destination is fine, you might wish to explore other destinations before deciding on HK. If you have decided to visit Hong Kong, be prepared for possible extra trouble and take additional precautions. 2 Keep calm. Do not panic, Do not get aggressive. If you are pulled aside for additional checks, do not panic.The immigration staff are only following instructions and won't have anything personal against you. Let them do their job and you keep your calm. Arguing or fighting with them won't help in any way. Understand that every sovereign country has full rights to decide whom they would let in and whom they don't want in. Immigration staff are only trying to validate your purpose of visit. Border formalities can get much worse. 3. Keep all your paperwork in order. -Be sure to book enough rooms/beds for every person in the group. Do not book less thinking you'll take extra bed. Book in regular hotel/hostel. Airbnb like private accommodations in residential areas may cause more probing. -Keep every member of the group informed of the plans in HK. If someone else is interviewed separately and appears clueless or gives conflicting details, you may invite trouble. -Additional stuff like business card/salary slip/IT returns etc can come handy. -If you have any intention of doing some work etc then do not try to enter under tourist visa. -Similarly do not plan a stay longer than 12-14 days (You can cover most tourist places in Hong Kong in a week's time. If you need longer stay, you can spend a few days in Macau and revisit Hong Kong but be ready to justify your extended visit. -Before heading to HK keep your family n friends informed, so that if they don't hear for a reasonable time, they can guess you are in trouble in HK. -Immigration process and formalities are subject to change over time. Check with someone who's been to HK recently or research online few days before your travel. The same evening that we entered Hong Kong, we boarded a cruise ship for an overnight journey- during this process we had to clear immigration again. No issues were faced during this. Next morning when we disembarked, immigration was pre-cleared, we didn't have to go through the process again. May be Hong Kong can introduce an electronic travel authorization form- in which visitors can pre-fill their details from their home country (like Srilanka) or make a much stricter process (like Singapore/Malaysia)-this can make immigration clearance smoother. But then, if such process are deployed, HK administration will have to spend more (on manpower and systems) to manage the process and visitors may avoid HK if visa process is complex, hurting tourism prospects. Apart from Day 1 immigration delay, we didn't face any other issue during our stay in Hong Kong. Dec 2016 update: Visa on Arrival for Indians will be discontinued effective Jan 2017. Pre-registration is needed. More details like is there a fee, processing time, what would be validity, other documents needed etc are not yet known. I am surprised Shrinidhi. I visited in 2014 with both my daughter and niece. I was the only adult. I was waved through. They just asked to pick up Chhavi and show her face to them, she was so small! If something like this would have happened to me with two kids I am not sure how it would go! I hope travellers can visit the countries, that too without being made to feel like terrorists! As rightly suggested if they are so condescending to visa on arrivals then remove it for indians and make it prior visa.that way its win-win for all. Regarding the previous incident in the blog link from your friend i didnt find anything out of the ordinary ,the IO was just trying to corroborate your friends theory. Prior visa will reduce the number of tourists- it can filter out not so serious travelers and make immigration smoother but will hurt tourism prospects. Luckily it was a super smooth process for me at the airport. Didn't face any hassle. However I was there for work and not leisure. Was it a tedious process as you were coming via ferry from Macau? We experienced the same above issues. 1 hour of detention despite all paperwork perfect to the brim,illogical questions like: where did you come to know about the tourist attractions,when I mentioned like 7 of them. My answer was simply : Internet. And they were like Whoa!!! 1 hour of sitting at the corner,watching everyone pass,but Indians detended,and asked stupid questions really make us think if we will ever again visit Hong Kong. Bangkok is way better and much more friendly. And like mentioned in the blog,Sri Lanka is by far the best country to travel with an ETA. No questions asked. Just a sticker on entry,with an advance ETA. Travel to other countries,which have equal tourist attractions. Avoid Hong Kong to avoid hassle after a 6 hour flight journey! @Niranjan- No, many people have faced this issue at airport too. For business purpose did you take prior visa or just declared on arrival that you are here on business? For travellers travelling to Hong Kong for more than 14 days or for work purpose,this is not an issue. Because you would need to issue a visa prior travel. This mainly affect tourists who wish to travel for a week or so,and to those who even transit. My friend clearly showed his hotel booking at the airport hotel Regal,because he was taking a flight to Canada. He was asked several questions,despite a valid Canadian and US visa. I have also heard of travellers complaining about rude behaviour,snatching passports away from hours and even more worse things I cannot say. I strongly agree with your entire blog,cannot disagree at a single point,and I recommend everyone to travel to countries where racism is not an issue. Hong Kong was a pure example of how Indian race was rejected or detended for no reason whatsoever. Very disappointing for Indians. If they really feel us to be immigrants,despite all hotels booked,itinerary,money and details,they should start a prior visa instead of boasting a free entry for 14 days. That's not really a free entry. That's a free hassle. i) how much money(in USD/HKD)? we need to show to clear the immigration smoothly? ii) we don't have return ticket from HK as we will visit Macau after HK, from Macau we have return ticket to India. will it cause any problem?